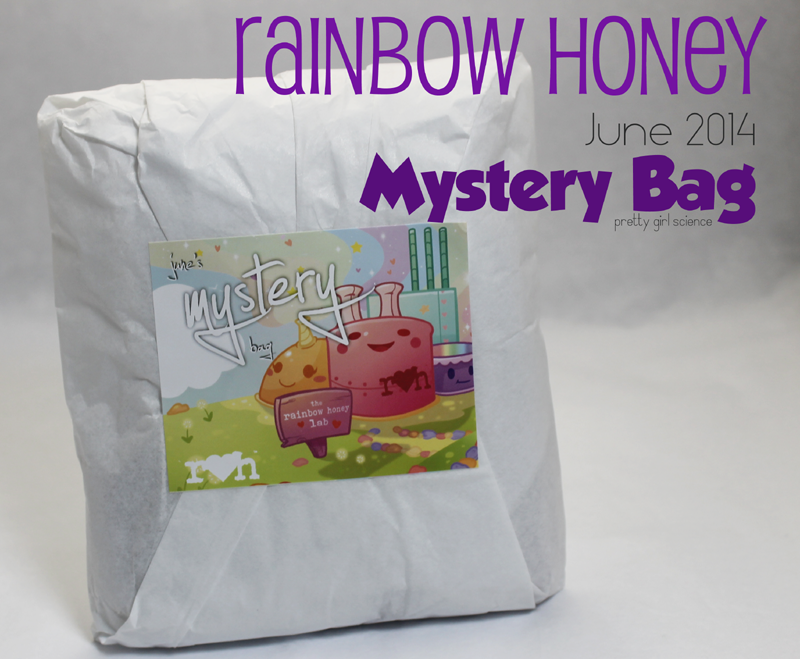 In the interests of trying new things, I picked up a mystery bag from Rainbow Honey. I have seen so many awesome pictures featuring this stuff, but I had never tried it...and since I've been making an effort to investigate more indie-everything, I figured this was the perfect time. It just so happened that I had exactly $10 left in my paypal account. It was meant to be. It came amazingly packaged. No way was anything breaking in this bag (maybe Ipsy ought to study this). It was in a bubble mailer, wrapped in paper, and then wrapped in bubble wrap. Secure all the things! All unpacked, and I was seriously surprised by the amount of stuff in there! I purposely didn't Google the bags, nor click on any links about previous bags. I wanted to be good and surprised. It was like a tiny, glittery christmas gift in my mailbox. For the cost, I really can't believe there was this much in there. Color me impressed...and glittery. 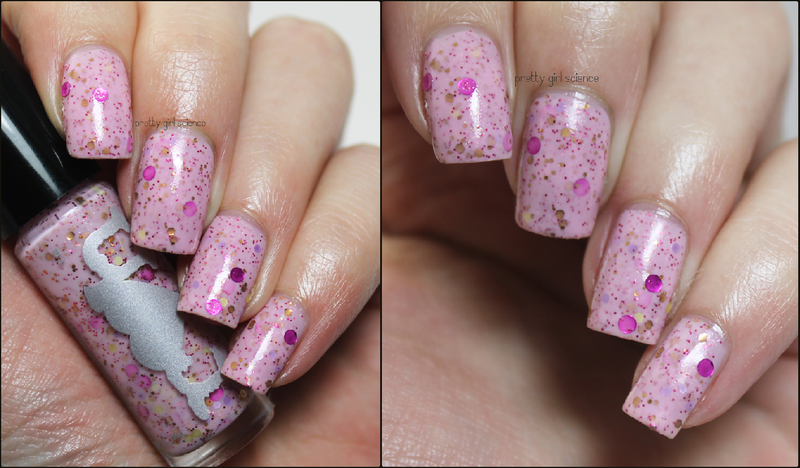 Rose Mararon is a baby pink jelly-cream absolutely packed to the gills with glitter. Somehow, this is nearly opaque in two coats...though I used three below. It applied easily and dried smoothly. One coat of seche vite was all it needed. My kids were in love...apparently this is the perfect Princess Aurora nail polish. My favorite part is the round fuchsia glitter. I'm a bit of a sucker for both round glitters and fuchsia, so when you throw them together I am a happy girl. 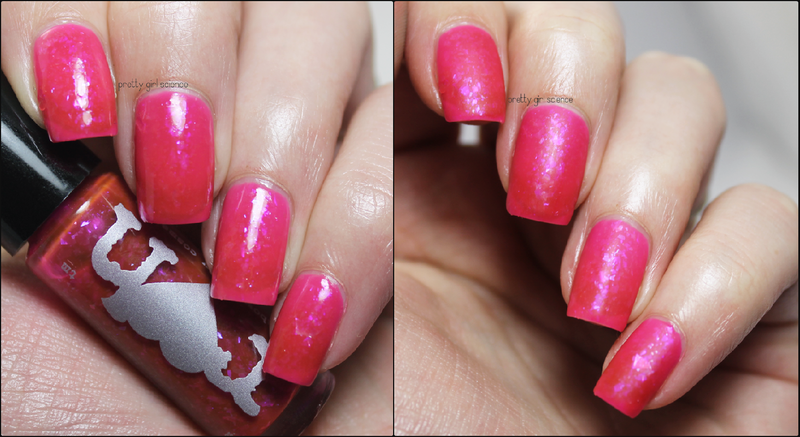 Ichigo is a warm, electric fuchsia jelly with iridescent flakies. I needed 3 coats below and I can still see the nail line...but its a proper jelly so I think that is how it is supposed to be. I love the subtle flash of the flakies, but I am over the moon with the matte coat on top. This polish should always be matte. Forever. The cuticle balm is dangerous. It is moisturizing and easy to carry around in a bag. (it is probably coming with me cross-country this summer) IT SMELLS SO GOOD I WANNA EAT IT. In fact, it smells like cookie butter and magic. I am afraid to let my kids near it for fear that they will actually eat it. I love the convenient travel-friendly case, and can't wait to annoy folks on the plane with it in July. The sugar scrub is gentle and effective. I stained the hell out of my hands playing with makeup, and it is helping me un-blue myself without removing all of my skin. It also smells like awesome, and again I wish to consume it. Soap is not food, however. The perfume is a bit of a miss for me. I'm picky, so I generally don't use perfumes without testing them for a day or two. This one has a warm, beachy scent to it. The husband hates it, I think because it has a very coconutty scent initially. He says it smells like tanning oil...which I don't mind. The kids like it, and I think it is a pleasant scent for little girls as well as adults. This mystery bag was awesome and fun. 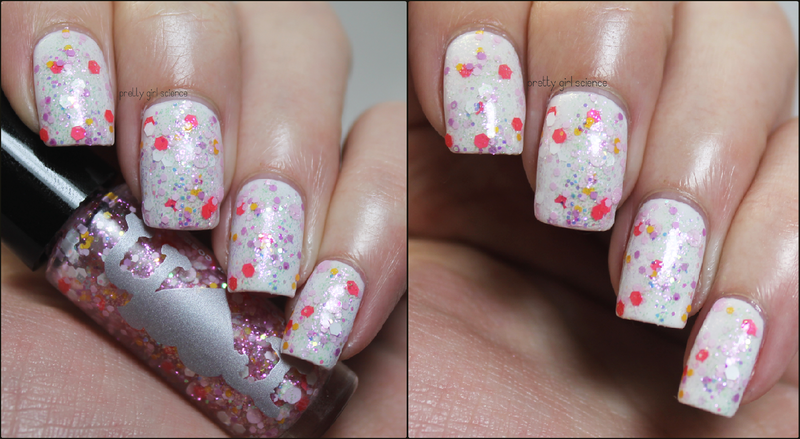 The only thing I haven't tried were the nail gems...because I am bad about picking at 3D embellishments. I'm sure I'll use them in a bit of nail art at some point though. They are wee and subtle, so I will make them work. I will definitely be considering July's mystery bag...and in fact, I might just subscribe to this over Ipsy. Nothing in this bag made me wonder "wtf were they thinking?" like Ipsy often does. If you have a spare $10, pick one up. Rainbow Honey has the best packaging. They must spend a fortune on the print stuff they send out. Always beautiful. I keep almost ordering the mystery bag, but then forgetting about it. I think I need to make it happen ! you must! There is so much in there, especially for the price. I can't wait to check out the next one. Nothing better than feeling like a majestic unicorn! I always see posts about Rainbow Honey over on Reddit....I feel a purchase coming on, no buys be damned! pick up a mystery bag! It's $10, and you get to test some random things out...plus, who doesn't like surprises! ?